Innovations have opened the doors to creating almost anything. Japan is a country with lots of inventors and scientists who create new technologies for the society to benefit from. One significant modern invention is the internet. Internet has made lives easier and more convenient. We use for almost everything from morning till dusk, and from dusk to dawn. But have you thought of carrying the internet with you in a very special way? Researchers from the Keio University came up with the idea of synchronizing the use of umbrella with internet. This is what they so-call as “pileus”. Pileus means umbrella, bell of jellyfish or head of mushroom. Basically anything half-spheric. Japan, as a busy country, likes working on ideas that save time for busy people. 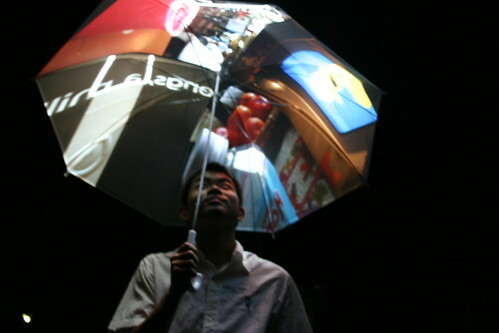 The internet umbrella will help you browse while moving during the sunny or rainy season. It primarily focuses on the GPS and digital compass. This is good for travelers or people who often get lost. Other features include camera and motion sensor. Wouldn’t it be great to watch your favorite movie while walking? Pileus saves time. This is very attractive for the busy people who are always on the go and don’t have enough time to web surf at home. Apart from this, you can take pictures and upload them immediately. No hassle and bustle. You can control everything with the grip of the umbrella. Many inventions come with both pros and cons. This product may not be suited for those who have problems with attention. You have to be great at multi-tasking. Imagine walking while browsing. This is a multi-tasking skill. At the same time while walking, you have to be aware of your environment so as to prevent accidents form happening. How well do you know Hello Kitty?